A kids motorcycle jacket can be a stylish and whimsical addition to a child's wardrobe. Kids tend to be tough on clothes--they outgrow them quickly and may be prone to ripping and tearing clothes while playing. 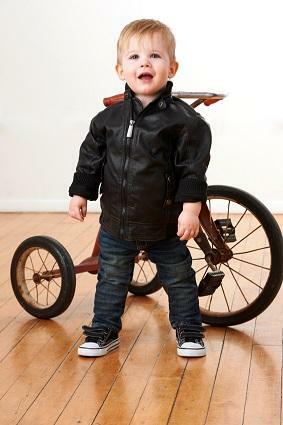 A kids motorcycle jacket can be a durable and stylish piece of outerwear that any child will love to sport. Whether it's the real thing or a knock-off, motorcycle jackets can become fun staples in a child's wardrobe. When your child has a coat as fun as this, you may not even need to remind him to wear his jacket! When manufactures and designers produce motorcycle jackets for kids, it does not necessarily mean that they are encouraging the young ones to ride dangerous bikes. Kids are simply playing around with grown-up clothing and wearing miniature counterparts of the clothes that look so cool on adults. Designers design these special coats with kids in mind. Whether it's a bomber jacket or a leather jacket, design and choice of jacket colors and cuts are geared towards the youth market. Bold, colorful, and loud are always appealing to kids. Children's motorcycle jackets can even sport cartoon characters, superheroes, sports themes, and rainbow hues for the girls. Motorcycle jackets are usually made of pigskin, cow skin, cowhide, or goatskin, although synthetic fabrics are also available. Depending on the climate, kids motorcycle coats can be lined or padded in order to provide both comfort and warmth. The coats are usually considered winter jackets, and have the requisite linings to provide both warmth and a fashionable fit.Children's motorcycle jackets may also have add-on accessories such as zippers, Velcro, patchwork, detachable hoods, nickel hardware and mini pockets. These accessories add to the authenticity of the jacket and can add pizzazz and interest to the outerwear. For those kids who are passenger bike enthusiasts, motorcycle jackets often include reflective radium materials. This helps kids avoid accidents since they will be more visible in the streets during the nighttime. Prices for kids motorcycle jackets range from approximately 20 dollars to hundreds of dollars. They are sold in boutiques, department stores, and even online. For budget conscious parents, there are many places to score these jackets. The department store may be a great place to shop. Retailers and designers often offer discounts, especially in the off season. Department stores such as Nordstrom, Macy's, and JCPenny carry many lines of discounted motorcycle or leather jackets for the kids. Checking outlet stores and thrift shops is also a great idea. These stores carry overruns and donations that tend to be priced more cheaply. Parents with some patience and a good eye for motorcycle finds may discover the perfect jacket for less. Online shops also carry motorcycle jackets, both new and secondhand. Ebay and Amazon are good websites to start with. They offer a wide selection of kid's motorcycle coats, as well as great discounts and deals. Kids motorcycle coats are usually sized as standard jackets. Sizes are noted in terms of numerical size, or in terms of small, medium and large. Your child should try on the coat to ensure a comfortable fit. Since kid's grow quickly, choosing a slightly larger coat may extend the usability of your purchase. Children's motorcycle jackets are really fun and can be practical too. A durable, good quality jacket can become a staple in a child's closet and may be handed down to future generations. The different design, colors, and accessories make dressing up really fun for kids, because if they can't be dangerous in real life, at least they get a taste of adventure when sporting a motorcycle jacket. For aspiring biker dudes and babes, a great jacket can also boost their confidence and make them stand a little bit prouder.